I’m back with another fudge recipe. Can I just say, being the candy contributor over at Food Fanatic is such an awesome gig. It basically “forces” me to create a couple candy recipes a month. Okay, so maybe they don’t FORCE me. They encourage me. They cheer me on! Well, today’s recipe is my way of saying thank you. I wish I could share this fudge with all of you, in person. One big meeting room filled with hungry, fudge eating friends! Or, I could just share the recipe and you can make it yourself. Yeah, I think that’s the route I need to take! 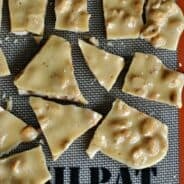 This is my basic white chocolate fudge recipe. Once you know how to make vanilla fudge, you can change up the flavors easily! You can swirl in any flavor preserve you like. I happen to think the Raspberry rocks my boat, but seriously, go with your favorite here! 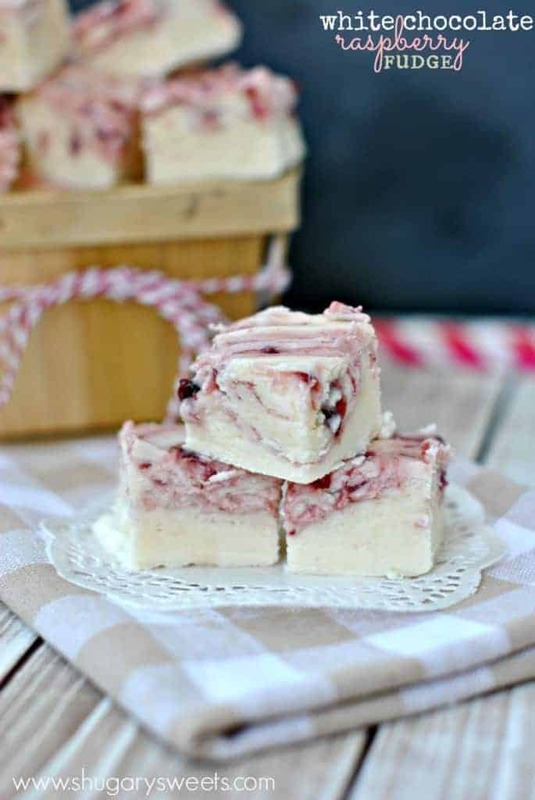 In a sea of chocolate and peanut fudge candy, this White Chocolate Raspberry Fudge would be a lovely addition to any holiday dessert plate. I know most people go crazy for cookies over the holidays, and admittedly I have a handful of family recipes we bake too. But for us…it’s candy making season. Instead of a traditional cookie plate that you might bring to a hostess or neighbor, try making a fun candy plate instead. You can search my archives for many great ideas. And the nice thing about candy, is most of the time it lasts for weeks. So you can make it ahead of time. I usually start making candy right after Thanksgiving. By the first week of December, I try to have a dozen flavors ready to go in my outdoor fridge. When I’m invited to a party, or need a quick gift…it’s already made and just needs a cute package. Speaking of packages, purchasing some dollar store plates, tins, and jars are a great inexpensive route! You can also use those plastic holiday bowls. Today, I’m using a berry container. I purchased a few of these for a dollar. Fun, right? Now, get your list of candy making together…and surprise your family and friends with some new recipes this holiday! Head on over to Food Fanatic to read more! I can never get enough of fudge but am a little weary to make it at home. You make it look so easy! Hoping over to have a look! You can do it Nancy!!! I know it! I could inhale an insane amount of this fudge! LOVE white chocolate and berries together! Pinned! You and me both Anna! Thanks for pinning. This may sound weird but this fudge reminds me of my favorite Quest protein bar. I totally want to make some right now! I’ve never had a Quest protein bar, but if it looks like fudge, I’m in! Awww thanks for pinning Renee! This fudge is gorgeous! Love the white chocolate + raspberry combo! Thank you Katrina! It was ALMOST too pretty to eat. Almost. Think When Harry met Sally…and I’ll have what she’s having!! Yes!!! I want this!! Raspberry rocks my world!! Thanks for the recipe and the link to many other candy (xmas) obsessions!!! Can’t wait to try! Thank you! White chocolate and raspberry is my favorite chocolate/fruit combination! These sound delicious! I love it when you make fudge, Aimee, because I can always count on the most creative and amazing flavors! This one is no exception. Can’t wait to try it! I was just telling myself tonight that I needed fudge in my life asap and then I saw this! 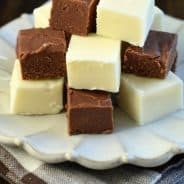 Your fudge looks great, I love a good white chocolate recipe! 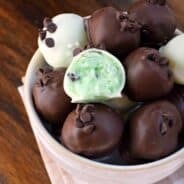 You just have the best fudge recipes! Plus I love the little wooden box! Ooh I love fudge! White chocolate raspberry sounds incredible. Yum! All hail the queen of fudge (and biscotti 🙂 )! 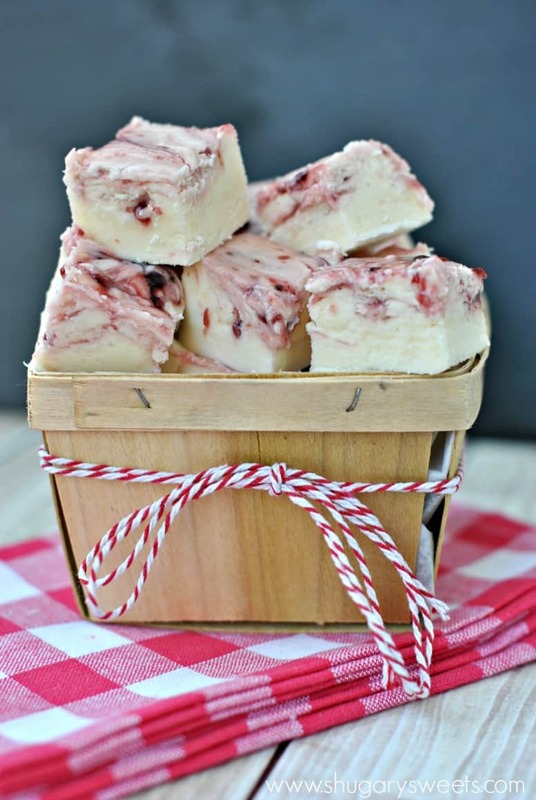 Gorgeous fudge recipe, I love the contrast of fruit and white chocolate. Amazing! This is such pretty fudge Aimee! And so yummy! Can you use evaporated milk for the heavy cream? Unfortunately no. The heavy cream is a different consistency than evaporated milk. 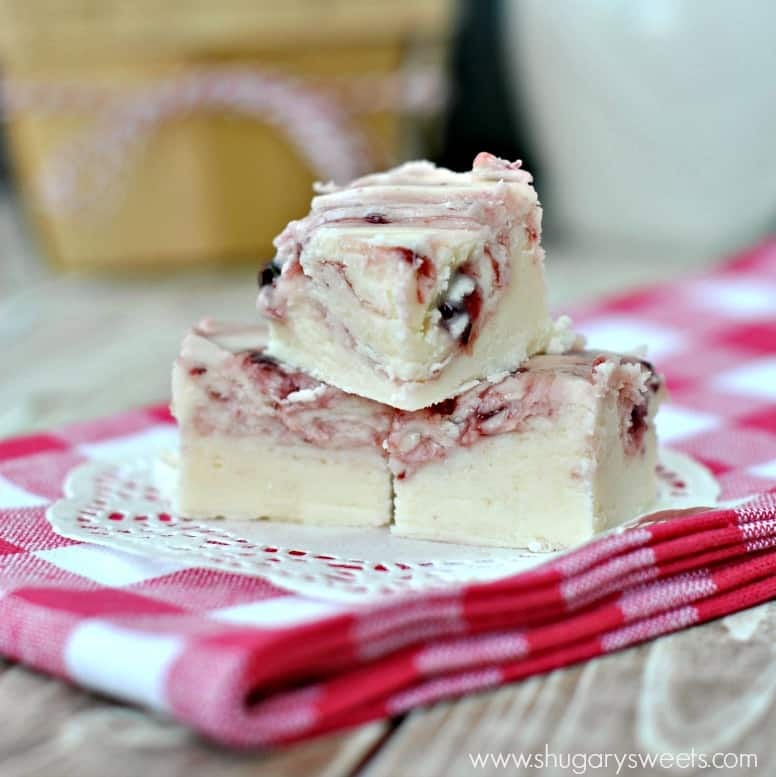 This sounds so delicious – I love the white chocolate and raspberry combo! This is so pretty, and I’m sure it’s delicious! I link ed to this post on my Christmas blog. This look just wonderful! I linked to you on my Christmas blog. I read your article and then I got to thinking about it and I thank you for sharing your article made me gain knowledge, research, and I like it. Best fudge ever. I mixed mine by hand….next time I will dirty the extra bowl. Thank you for sharing. Could I use the torani raspberry syrup instead of jam? How would that work? I think the syrup might be too liquidy and cause the chocolate to seize. But, you can always give it a try and let me know!! This was delicious but think something went wrong and I followed the recipe to a T. I set in fridge all night and waited till morning to cut. It wasn’t very hard and when i took it to work it got softer and softer throughout the day. So we had to use a spoon to eat it. I’m not sure, as I haven’t tried that. The cream has a higher fat content, so I’m not positive it would work. But if you try it, report back and let me know how it turns out! I made this last night to put in my Christmas tins for friends and family. It is delicious and so pretty. I should have mixed in the jam better so it was messy. I think when I make this again I will try your 2nd option of mixing in the raspberry jam. I love finding different flavor combos. I think I will try blackberry jam too. I like how the tanginess offsets the sweetness. Thanks for sharing! I made it and it didn’t set up. Does this need to be cooked to a soft ball and then beaten like classic fudhe?